The Salzkammergut area is among the most popular regions in all of Austria: Especially during the summer, visitors stream into the Salzkammergut to enjoy picturesque towns, lakes and mountains. Many international tourists make the mistake to think of the Salzkammergut lake district as a federal province - which it is not. In fact, the term "Salzkammergut" refers to a part of Austria with a district culture and millennia of tradition in mining and trading salt. With respect to administrative provinces, the Salzkammergut spans parts of Salzburg, Upper Austria and Styria. If you plan to go to the Salzkammergut lake district from Salzburg for a day-trip or short excursion only, we recommend a public bus to one of the nearby towns: Fuschl is a village by Lake Fuschlsee that makes a good base for hiking; the village of Fuschl itself is rather touristy, but hiking around the lake (takes about four hours) or up to Mount Schober will offer you great vistas. Lake Fuschlsee is one of the clearest lakes of Salzburg and the province′s biggest freshwater reservoir - nonetheless, swimming is allowed almost everywhere around Lake Fuschlsee. Note also the beautiful and popular town of St. Gilgen with the famous Schafbergbahn Cog Railway and Strobl. Sometimes Hintersee, Hof and Thalgau are also considered to be part of the Salzburg-share of the Salzkammergut. More on this area below. Mondsee is already in Upper Austria, but particularly well-connected to Salzburg via the highway. The mighty Basilica of Mondsee featured in "The Sound of Music", as the church where Fräulein Maria turns into Frau von Trapp (the wedding scenes). Beyond that, Mondsee is a pretty place and the first "typical" Salzkammergut town: Walk the lakeside promenade, visit a little church of pilgrimage nearby or enjoy the Baroque town centre. Like other lakes of the Salzkammergut, Lake Mondsee is popular for sailing and other water sports. The town of St. Gilgen is again on the Salzburg side of the Salzkammergut lake district. It has a Baroque core, an international boarding school and the obligatory lakeside promenade. The former chancellor of Germany, Helmut Kohl, used to spend his summer vacations here. Today, it can be crowded in the summer, mostly because of the ferries: Boats connect St. Gilgen with nearby St. Wolfgang and the village of Strobl. 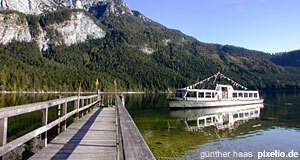 The cruises are famous and among the most popular attractions in the Salzkammergut. St. Wolfgang is a famous spa town, Upper Austrian again, and rather crowded. Here you find the starting point of the Schafbergbahn, a railway with a steam engine that dates back to the 19th century. Once again, this device featured in "The Sound of Music" and draws the crowds to the Salzkammergut lake district. Further south, Bad Ischl has preserved much of its imperial charms. The ancient spa town was among the first areas in the Salzkammergut that became popular with tourists in the early 19th century, most importantly Emperor Franz Josef I. It is good for hiking tours in autumn; it is a bit further away from Salzburg, but due to its central location, it makes a good base for your in-depth Salzkammergut lake district experience. Bad Ischl′s main attractions are the Kurpark and Kurhaus (spa park and pavilion), the Imperial Villa and the thermal spa Kaisertherme. In the eastern corner of the Upper Austrian Salzkammergut, you find Lake Traunsee and some of the prettiest towns of the area: Gmunden is famous for its three palaces, most importantly Schloss Weyer and Schloss Orth palace; its ceramics manufactory that still produces its characteristic, rustic plates, jugs and cups; the surrounding mountains and lines of cruise boats. Following the Western shore of Lake Traunsee, you get to Traunkirchen and Altmünster, two very scenic Salzkammergut cities. East of Lake Traunsee, the Almtal valley marks the end of the Salzkammergut - the picturesque valley was the second home of behavioural biologist and Nobel laureate Konrad Lorenz. Note that this part of the Salzkammergut lake district is already far from Salzburg and not suitable for day-trips. The southern part of the Salzkammergut belongs to Styria. Beyond famous skiing resorts such as Schladming, the Styrian Salzkammergut is particularly deep-rooted in its traditions. It is here where some of Austria′s most famous Tracht (traditional costume such as Dirndl dress or Lederhosen) can be found. The town of Hallstatt is a World Cultural Heritage site and very famous. Nearby Altaussee and Bad Aussee are well-known for their daffodil festival in early summer.